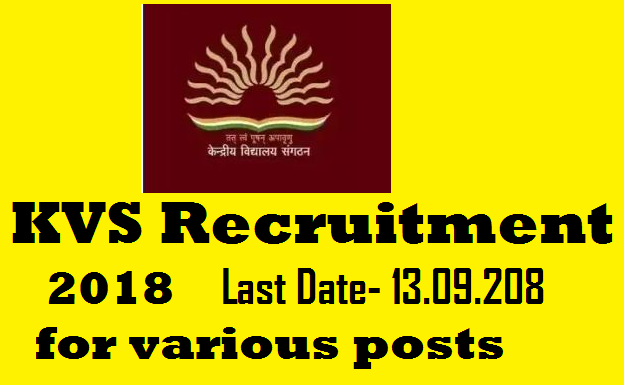 For the KVS recruitment 2018 for 8339 Posts of Principal, Vice Principal, TGTs, PGTs, Librarian & Other postsKendriya Vidyalaya Sangathan (KVS), invites online applications from Indian Citizens across the country. Those interested Candidates who fulfill all eligibility criteria in the vacancy details can apply for below-mentioned posts. Interested candidates can apply online mode from 24.08.2018 at through official website kvsangathan.nic.in. Candidates can download the notification from the official website for details. For KVS Recruitment 2018 Candidates can apply only online through KVS website; no other mode of submission will be available or accepted applications. The recruitment test will be organized through offline mode. Primary Teacher- 30 years max. Note: Candidates are advised to read the official notification before applying for the posts. Please share this post with your friends on social media and keep a regular visit for KVS Recruitment 2018 more updates.